Taking a systems perspective allows systems analysts to start broadly clarifying and understanding the various businesses with which they will come into contact. 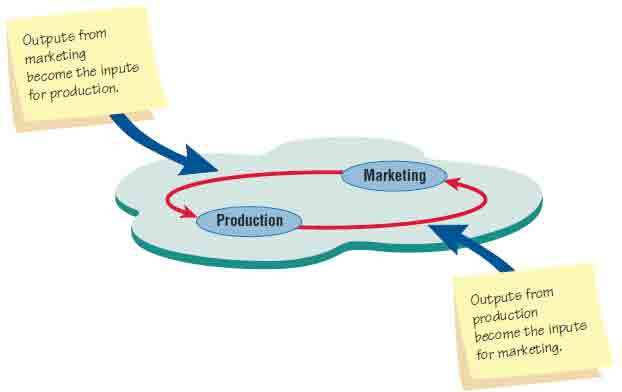 It is important that members of subsystems realize that their work is interrelated. 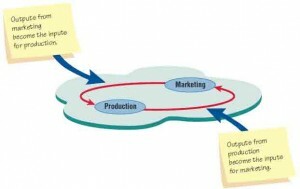 Notice in the first figure illustrated below that the outputs from the production subsystems serve as inputs for marketing and that the outputs of marketing serve as new inputs for production. Neither subsystem can properly accomplish its goals without the other. Problems occur when each manager possesses a different picture of the importance of his or her own functional subsystem. In the second figure shown below you can see that the marketing manager’s personal perspective shows the business as driven by marketing, with all other functional areas interrelated but not of central importance. By the same token, the perspective of a production manager positions production at the center of the business, with all other functional areas driven by it. Outputs from one department serve as inputs for another such that subsystems are interrelated. The relative importance of functional areas as revealed in the personal perspectives of managers takes on added significance when managers rise to the top through the ranks, becoming strategic managers. They can create problems if they overemphasize their prior functional information requirements in relation to the broader needs of the organization. 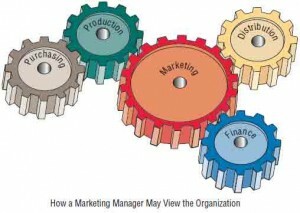 A depiction of the personal perspective of functional managers shows that they feature their own functional area as central to the organization. 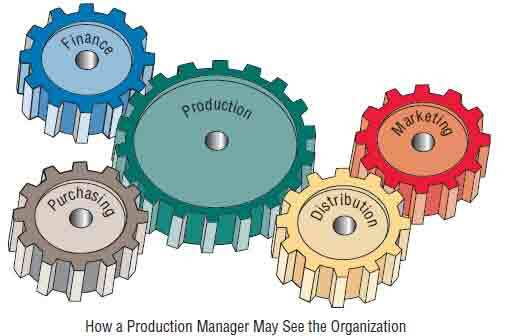 For example, if a production manager is promoted but continues to stress production scheduling and performance of line workers, the broader aspects of forecasting and policy making may suffer. This tendency is a danger in all sorts of businesses: where engineers work their way up to become administrators of aerospace firms, college professors move from their departments to become deans, or programmers advance to become executives of software firms. Their tunnel vision often creates problems for the systems analyst trying to separate actual information requirements from desires for a particular kind of information.